Last weekend I managed to get the layout fitted to it's permament support, rather than just resting on top of the bureau! The key components are these drawer sliders, recovered from some old furniture by a Sussex Downs club member. I have used 4, 2 each side, to take the weight without twisting. They are fixed between two strips of wood, one fixed the the wall (in this case the side of the chimney breast) and the other to a shelf. 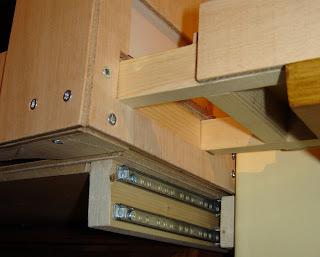 The shelf is a ply and MDF laminate, the ply (top layer) is cut to fit inside the bottom of the layout. 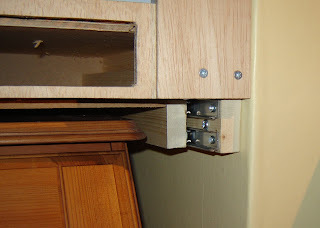 The shelf doesn't take the weight of the layout as it baseboard is rigid, so the weight is supported by the softwood ends straight onto the sliders. 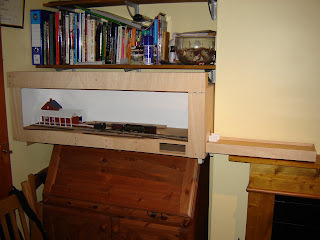 The layout sits flush into the alcove, but for full operation it slides forward by about 7 inches, allowing the fiddle yard to slot onto the right-hand end, canterlevered over the mantelpiece. The fiddle yard just pushes in supported by it's extended frames. When I put the wood for the sliders on the walls I got my calculations slightly wrong, and the layout was about 1/4 inch high and hit the shelf above - that's how tight the clearances are! With a little adjustment of the shelf design I managed to lower the layout by 1/4 inch so got the clearance back. Once the layout is finished the ply will be stained a similar colour to the shelves above and the fireplace, so it appears to fit into the room as a piece of furniture. So there it is, pulled out and reasy for use. Well apart from the rest of the work to complete the layout! 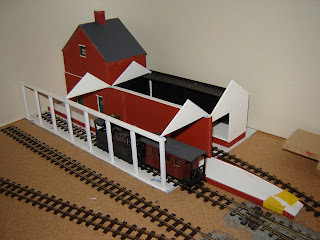 Just to prove I have been making progress with the station and goods shed. There are now doors into the station, the upstairs and roof to the station office, the goods shed has a platform and back walls. Note that the rear walls and anything that cannot be seen is plain black plasticard - no point in modelling the unseen. I have just finished the platform - 5mm foamcore faced with brick (the yellow tape was holding the brick on while the glue dried!). I have now made a start on the roofs - I want to give the illusion of visible roof trusses over the platform, so that won't be easy!